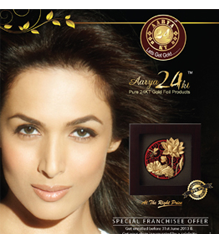 Started in 2009, Aarya 24kt had been the only company manufacturing certified 24kt gold foil products. With a vast range of products at a very affordable price, starting from Rs. 100/- only is something that every person looks forward. Aarya 24kt has proved once and more its peerless nature in terms of quality, price and distinctive designs. Aarya 24kt today boasts of being the proud owner of a few company owned stores, department stores and other retail outlets with products quoted at MRP. Supported by international certifications of scientifically tested purity and authenticity across India and other parts of the globe. Presently, our business model integrates franchising, corporate gifting and on-line sales. We offer product line in diverse styles: traditional, international, classic and casual; for all age groups, tastes and budgets. Being one of the very prominent names in the Indian market with such innovative product line, Aarya 24kt now has made a remarkable presence internationally with franchisee spread all across Dubai, Singapore Canada and more. To become the world's leading company in 24KT gold foil product line. To have a strong, global diversified infrastructure. To intergrate its activities by efficiently linkingits collection through marketing and promotion strategies. To create incremental demand in gold foil artifacts. To create enterprise and brand value to increase the net worth the company. To protect our employee interest and help him upsurge his personal and social status. To remain a loyal brand for our customers worldwide. We are a global family with a rich heritage, committed to our consumers to provide them the best. We understand our buyers wants and always do our best to give them variety. Our business is based on three prominent pillars, our firm focus on the market, identifying the customer needs, gathering resources to fulfil it and an intense urge to excel. We are a multi-faceted team that gives due respect to every member. The welfare and interest of our people is our prime concern. Our integrity is never compromised and we make positive contributions to the society. We persistently want to improve in all possible ways. We believe in being the best. 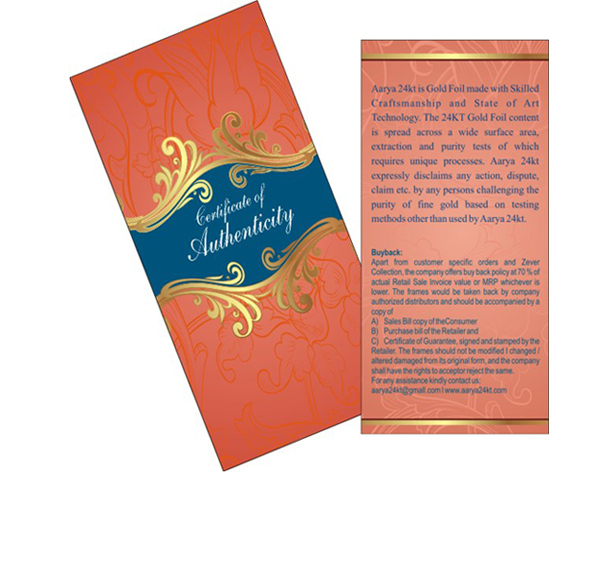 Aarya 24kt is Gold Foil made with Skilled Craftsmanship and State of Art Technology. The 24KT Gold Foil content is spread across a wide surface area, extraction and purity tests of which requires unique processes. Aarya 24kt expressly disclaims any action, dispute, claim etc. by any persons challenging the purity of fine gold based on testing methods other than used by Aarya 24kt. 'AARYA24KT' deals in gifts, artifacts, home decor and corporate products made from pure 24kt gold foil. Aarya24kt possess an outstanding product line and product quality, built on an intense passion for innovation & visionary thinking. "Make an impression everyday with the florals round your neck.”Zever", 24kt Pure Gold Foil Floral Jewellery Collection. Exquisite light weight jewellery made from 24kt Gold foil in floral designs. Wide range of Garlands, Necklaces, Rings and Earrings are available. 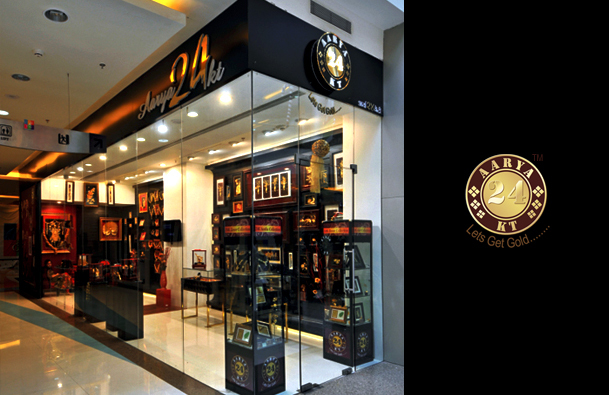 Pure 24kt Gold Coverings, carved in various images in form of Frames and Coins. A Brand par excellence, derives its name from Spanish word “Plata” which means Silver Plated. Da Plataa is a unique lifestyle brand featuring superior quality and excellence in designs. Da Plataa shares sensibility of beauty and style. The elegant packaging used makes Da Plataa an even more ideal gifting option. “Estatua – Silver Plated Statues”. It’s a brand that deals in statues of all forms and sizes. A wide range of products at affordable price, complimented with beautiful packaging. Aarya Silver 999, is a brand where images are carved in Pure Silver sheets, beautifully framed and encased in Acrylic Stands. It is an extremely affordable gifting brand with competitive pricing. Aarya introduces elegant looking barware and glass wares that are embedded with 24kt gold crush and is a perfect mood setter for high spirited people. We develop bespoke shapes suited to every drink and are ideal for use in bars, nightclubs, any outdoor venues or even at home. Pan India strong Distributor Retailer Network. Have tapped jewllers in smallest but potential towns, pan India. Experienced staff with a minimum 5 years’ experience in the jewellery industry and experienced business achievers. Strong Rapport with retailers. Close supervision and business monitoring by company seniors. We introduced market oriented products with good business — product promotions. Regular visits & telecoms to distributors and retailers by company management. We believe that a one to one relationship with all our business partners has helped us grow positively. Issues if any are resolved immediately. Disclaimer: Aarya 24kt is Gold Foil made with Skilled Craftsmanship and State of Art Technology. The 24KT Gold Foil content is spread across a wide surface area, extraction and purity tests of which requires unique processes. Aarya 24kt expressly disclaims any action, dispute, claim etc. by any persons challenging the purity of fine gold based on testing methods other than used by Aarya 24kt.